Joe Torre turned down a one-year offer to manage the Yankees next season on Thursday October 18 because he believed the offer was insulting. 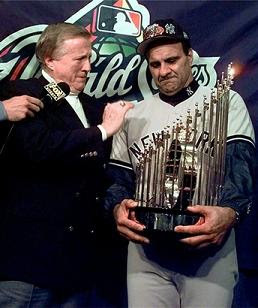 The offer was the ultimate result of a statement made before game three of the American League Division Series against the Cleveland Indians by George Steinbrenner. He said that if the Yankees did not advance past the Indians in the first round of the playoffs Torre would not be brought back next season. Immediately following the Yankees third straight first-round exit from the playoffs Torre spoke to the media as if it were the last time he would be holding a post game press conference as a Yankee. Many believed that it was only a matter of time before he would be out of the picture, but following the game, possible free agents, Mariano Rivera and Andy Pettitte said that Torre’s departure would weigh heavily on whether or not they came back. So instead of announcing he would not be back and the team would be moving on George Steinbrenner, his two sons Hank and Hall, Randy Levine, and Brian Cashman kept him on the hook for the next nine days. In an attempt to save face with the players and fans the Yankees decided to offer a one-year nonnegotiable incentive laden contract which included a 25 percent pay-cut and seemed like it was designed to be rejected. Torre rejected the contract which would have retained his status of the highest paid manager in baseball and the following day he held a press conference near his suburban New York home. Sitting in front of a logo-less navy blue backdrop Torre explained why. He said the team showed they were not satisfied with him by offering to take him back at a reduced salary. He went on to say the team showed it was not committed to him because they were not willing to discuss the details of the contract and the brevity of the deal would keep him locked into lame-duck status. Finally Torre blasted the incentives saying that he understood the team’s goals and felt like his motivation didn’t need to be questioned. 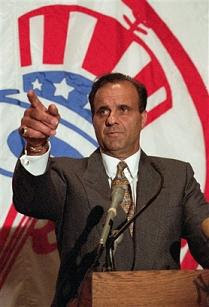 Joe Torre was picked to be the manger of the Yankees November 2, 1995. Since then he has taken the Yankees to the World Series six times and won the World Series in 1996, 1998, 1999, and 2000. He was named American League Manager of the Year in 1996 and 1998. During his 12 years as manager of the Yanks the team went to the playoffs every year and had a combined record of 1,173-767 during the regular season and 76-44 in the post-season. He said during the press conference Friday that his time managing the Yankees has been the most exciting years of his life.